Ashtabuyagaram Sri Adikesava Perumal is one of the 108 Diya Desam situated in Kanchipuram, Tamil Nadu. This temple very close to Sri Yatothkari Perumal Temple and it is 2 km away from Sri Varadaraja Perumal temple, Kanchi. This is one of the oldest temples built by the Pallava Kings. The inscriptions on the temple wall reveals the grandeur of this temple and the oldest inscriptions were found date back to 820 A.D. The only divya desam where Lord Vishnu is seen with 8 hands. The story of this temple too revolves around Saraswathi’s attempt to stop Brahma’s Ashwamedha Yaagam. 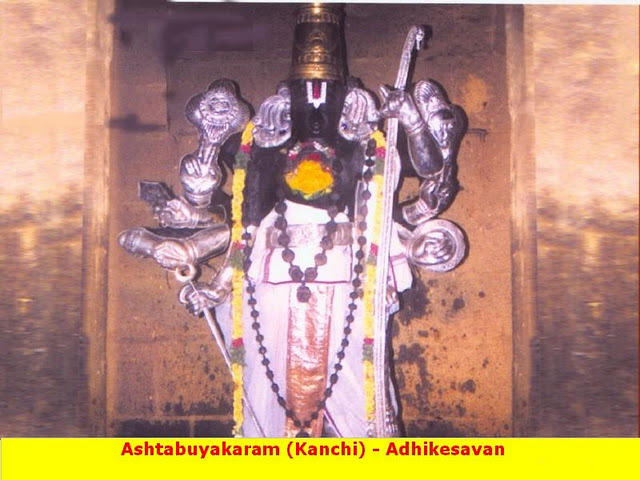 In this temple Lord Adikesava is in standing posture with fierce weapons in eight arms (Ashtabujangam). The legend has that Lord Brahma prayed to Lord Vishnu to protect the Yagna conducted by him and ward off any evils which creates hindrances in the performance of Yagna. The most pleased Lord Vishnu come into sight as Lord Adikesava with eight arms, the seven arms holding the perilous weapons Dice, Wheel, Conch, Bow, Arrow, Sword, Shield and Mace. In this way Lord Adikesava appeared before Lord Brahma and protected his Yagna. Lord Shiva also can be seen as ‘Sri Sarabeshwar’ protecting the Yagna Sala in this temple. Another legend has that Sage Mahasudha was underwent severe penance. Lord India was anxious to see the severe austerities followed by Sage Mahasudha. Lord Indra was very concerned about his title, inorder to safeguard his highly honored title ‘Indra’; he assigned a few celestial dancers to Earth to create an obstacle to Sage Mahasudha’s penance. The celestial dancers disguised into attractive elephants and distracted the attention of Sage Mahasudha and succeeded in their mission. Sage Mahasudha fallen prey at the trick played by Lord Indra and spent several years in their company as the chief of the elephant. Later Sage Mahasudha realized his foolishness. At the divine instruction of Sage Markandeya, the elephant practiced to worship Lord Vishnu with lotus flower. While elephant was plucking lotus from the pond as usual to worship Lord Vishnu, a crocodile caught its leg firmly and the fight between the two went on for several years. Finally, Lord Vishnu hurried to save the elephant from the clutches of crocodile and the crocodile was killed instantly with His fierce weapon Dice. Thus, the king of the elephant Gajendra attained salvation at the Lotus feet of Sriman Narayana. This is the only Divya Desam in Kanchipuram that has a Swarga Vaasal (Gateway to Heaven). Festival – Chithirai Brahmostavam, Gajendra Moksham in the Tamil month Adi, Pavithra festival in Avani and Margazhi Festival. Those buying building sites and farm land and those facing problems in houses built already pray to Perumal for removal of any evil elements in the places. The temple is one among the 108 Divyadesas of Perumal. This is the only Perumal Temple where Lord appears with 8 hands-bhujas. A separate Mangalasasanam is addressed to Mother by Azhwar only in this temple. The temple is 2 km from Kancheepuram bus stand at Tirukachi Nambigal Street in Chinna Kancheepuram. Phone: +91-44-2722 5242 ; 9447573942 ; 9962997704.